It’s the Salem Witch Trials meets Mean Girls in a debut novel from one of the descendants of Cotton Mather, where the trials of high school start to feel like a modern day witch hunt for a teen with all the wrong connections to Salem’s past. 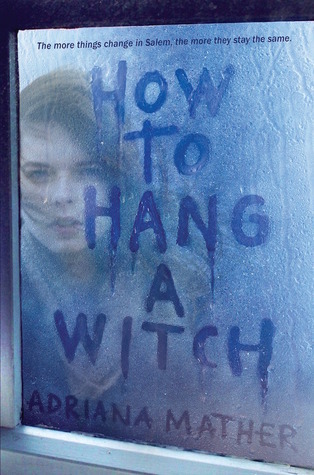 How To Hang A Witch was a solid debut and a fun, slightly creepy Halloween read. It reminded me of both The Craft and Mean Girls, which is high praise for me. Yes, it has a few issues still, but overall I enjoyed this one so much that I flew through it in 2 days. And I will be keeping an eye on Adriana Mather for new books, whether they are a continuation of this story or something completely new. But first, let’s discuss How To Hang A Witch! The atmosphere. I absolutely LOVED the atmosphere in this book. The story takes place during autumn and it felt like the autumn mood just seeped through every page of the story. From the haunted house to the creepy forests, I felt like I could see it all play out in front of me. The history. It’s obvious that Adriana did a lot of research on the history of Salem. The plot was infused with a ton of stories on the Salem witches and on Cotton Mather. I’ve always been interested in that history and I learned so much here and I can’t wait to research even more. The plot. The story is very plot-focused and while that does have some negative impact on the characters (more on that later) it did mean the story was quite a ride. It felt like non-stop action and I just could not stop reading. I NEEDED answers, I needed to know what would happen, I needed to know who was behind everything. I was suspecting EVERYBODY. I’d like to say that when it is finally revealed, that I knew all along, but honestly… I suspected everybody so it was both a surprise and blindingly obvious! The message. Yes, this story is about Salem and witches and ghosts. But underneath that, there is the message that bullying is dangerous, but silence in the face of bullying is even more so. Kudos for that! Elijah. OK, I admit it, I like ghosts. Especially handsome, nice ghosts who are able to get you a croissant from Paris in no time. That said, the story did have a few issues that took the story down to 3,5 stars. An annoying main character. Samantha made me feel old. I caught myself thinking “Young lady, watch the attitude and show some respect” pretty much every chapter. And I don’t like feeling old. The love triangle. Does it count as a love triangle when one of them is actually already dead and a ghost? Either way, I did not like it. It didn’t need to be there. It wasn’t overpowering to the story, but I would have liked it better if the relationship with one of the boys was kept as platonic. Weak characterization. Because the book was so plot-heavy and moved so super fast, the characters suffered. The boy-next-door was just a nice boy who lived next door. The mean-girl-descendants were just mean girls descended from witches. I couldn’t get any feel for any of the characters. They all felt a bit flat and stereotypical. Confusing villain motivation. Maybe it’s just me, but when the big revelation finally came I was confused. It did not make all that much sense to me. And then the ending came so abruptly that I was just left in my confusion. So overall, it was not a perfect read, but I still really enjoyed it. The ending left me wanting more. I’m keeping my fingers crossed for a sequel because I NEED answers. And ok, I need more Elijah. I’d recommend this to anyone interested in Salem history and looking for a fun, quick Halloween read. Have you read How To Hang A Witch? What did you think about it? I think the main character would make me feel old with her actions also. And the dreaded triangle ugh. I like the salem witch trials concept but… there are some really annoying parts in this book it seems. I keep reading mixed reviews for this book and it sounds like you experienced some of the same issues other readers did. I’m torn because some of it sounds so good but then that bit about the annoying main characters is just ugh. I’ll probably still read it but won’t be in as big of a hurry. Great, honest review though!